Sunniva Brynnel is a Swedish piano accordionist, singer and composer. In 2017, she was awarded Albin Hagström Minnesfonds scholarship for accordionists through the Royal Academy in Stockholm. Sunniva comes from a lineage of seven generations of female musicians, and her mother – Swedish folk singer and vocal coach Rosa Brynnel – is one of her major influences. 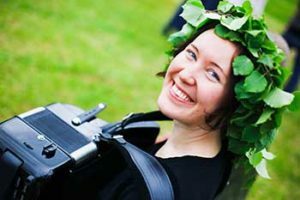 Aged 19, Sunniva moved to Ireland to study Irish Gaelic singing and music at DIT Conservatory of Music and Drama in Dublin. After a year in Dublin, she moved on to study jazz performance at Birka FHSK outside Östersund, Sweden. This year, living in the Swedish snowy midlands by beautiful lake Storsjön, also immersed her in Swedish folk music from county Jämtland. To be able to immerse herself in both jazz and the music of the British Isles, Sunniva then went on to study a BA Jazz at Leeds College of Music, England, with composition as her major subject. Sunniva graduated from Leeds College of Music in 2012 with a 1st class honours. She also has a Swedish music teaching degree from Gothenburg University, Sweden (2016). Sunniva is currently based in Boston, US, where she graduated with a Masters of Music in Contemporary Improvisation (Academic Honours) from The New England Conservatory in May 2018. She has performed in England, Ireland, Scotland, Norway, Sweden, Denmark, France, Turkey, Slovakia and across the US. Within the US, she has toured extensively as part of Swedish/American band Night Tree (www.nighttreemusic.com). Her current musical projects include Sunniva Brynnel Group and Swedish folk group Blå Dager. Sunniva also enjoys improvising music together with plants as well as exploring the text scores of composer/accordionist Pauline Oliveros. See www.sunnivabrynnel.com for more info.